I have been here in Tokyo for a while now and the lure of its food culture has not worn off. Every time I leave the house and bike down an unfamiliar street I am confronted with things I want to eat. Mysterious restaurants, alleyways packed with tiny izakaya, a butcher shop selling cheap yakitori — even at the little kid’s park near my house, is an old man selling Takoyaki — balls of savory dough encasing a chunk of tender octopus. His shop window is part of his house and he is there every day, genial and patient, knowing that one day, I will break down and try them. In addition, my blog writing has caught the attention of my Japanese friends who are all too eager to show me places in their neighborhood, the spots that I could never find myself. I am convinced that I could eat at a different place every day for my remaining years and still only touch the surface of what Tokyo has to offer. And that would be good food. The standards are just so high here. That said, there are some really bad food things in Japan that have made me miss New York. The bacon in Japan is terrible. I am not sure if it is the curing process, the types of pork belly used, but I have tried tons of different brands all to great disappointment. Japanese bacon does not cook properly and is loaded with nitrates. I can’t really comment on flavor, because the bacon I have tried barely has any. I would kill for a regular supply of Applegate Farms Sunday Bacon . Thoughts of the homemade bacon and Black Forest ham from Jubilat Provisions would be indulging in too much fantasy. In fact, I would go so far as to say the general quality of cured meats in Japan is pretty terrible. I am sure there are some specialty shops, and I know of one very expensive Italian Import shop. But, the regular store-bought salami is an aberration — it almost tastes as if made by someone who had never tasted salami. My daughter, who at 6 was just as happy to have a piece of Boar’s Head Genoa Salami than the incredible, regional salamis on offer at my beloved Caputo’s, could not even get down one tiny slice of Japanese salami. Unfortunately, this extends to Japanese sausage. While the German style, fine ground, sausages are pretty good here; the versions of chorizo or Italian sausage have been mockeries. I miss Fairway. The Red Hook location is one of the great shopping locations in the world. Whenever I felt down, I would head over there. I would leisurely peruse the great cheeses on offer, load up on a variety of olives, cornichons, and pickles; dip a piece of day-old baguette into some rare olive oil. Then I would park my shopping cart, buy a coffee and step outside into the grandeur of the New York harbor with the Statue of Liberty glowing green. With any luck the sun would be setting and Technicolor beauty would fill the skies, reflecting off the choppy seas. My mood would never fail to improve. Even if it were in a bomb shelter located in Paramus, I would miss Fairway — it has been tough to find a reasonable and inexpensive supply of olives, pickles and spices in Tokyo. i should not even discuss the bagel situation. What I have seen does not inspire confidence. What I have seen makes a frozen packet of Lender’s bagels seem authentic. 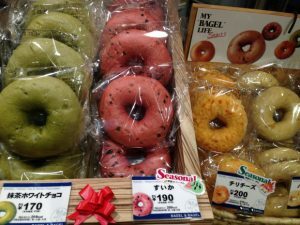 I think there is a possibility that someone got the words for doughnut and bagel mixed up — I have seen watermelon, strawberry, blueberry and some other perversions. Admittedly I am a bagel purist. In one of my more unseemly moments, I was visiting a very sick friend at Lennox Hill Hospital on 77th Street. Seeing as we were close to Pick a Bagel, I offered to get her something. “Get whatever you want!” I said. What she wanted was a blueberry bagel with something like strawberry cream cheese. Without thinking, I turned her down and very possibly mocked her for such a request. She ended up with an everything bagel, scallion cream cheese and a slice of tomato. Our friendship was never the same. Oddly I have not missed many restaurants, just ingredients and staples. Being away from cheap and easy supplies of Middle Eastern foods have made me expand my horizons as a chef. I have learned to make pita bread, home-made falafel and been dabbling in shashuka, hummus, baba ganoosh and a variety of salads. I feel a Greek period may be coming. I will not however, learn to make bagels. There is a terroir to New York bagels as sure as there is in the great wines of France. That vast network of aqueducts and ageing cast iron pipes that bring the water from the Catskills combine with native yeasts and bacteria to create a unique flavor…and there is nothing quite like getting a paper bag full of warm, just out-of-the oven everything bagels and smelling that melange of onion, sesame and garlic. Impossible to get home without eating one. It is all okay though. I may miss some foods now and again, miss my friends, miss my family, miss the sight of the Red Hook Pier. I may miss how easy things were in New York: barrels of olives, English language labels on cleaning supplies, toilets that I fully understand how to flush. This is all true. But, there is something to be said for limits. To not having everything all the time. In a hundred years we may all be living in a mega-mall that stretches from ocean to ocean, but for now, I am content to sit on a park bench with freshly made Takoyaki while dreaming of a bialy and a whitefish salad. Oh,well. Consider this. Most of the foods you miss are unhealthy. You are living one of the greatest food journeys of all time, and you’re going to kvetch about missing stuff from somewhere else?!?! Each one of your food posts is like a skin flaying for all of us so far away from Japan. Licking the pictures has done nothing, but what else can I do?!? !